Kevin was one of the UK’s first technical divers and was responsible for setting up IANTD in the UK during the early 1990’s and he has been involved with Technical Diving since its inception in Europe. 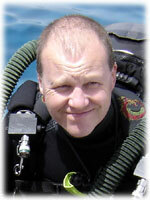 As well as being the first Technical Diving instructor outside the USA, he has led and been a part of many expeditions; the first sport dives on the Britannic in 1997, treasure hunting in the Pacific (and several other locations World-wide), film making and a dive on the Titanic in the MIR submarines to name a few. Kevin Gurr is the designer behind the Ouroboros and Sentnel rebreathers and the VR3 dive computer. As an engineer and diver he is the co-owner of VR-Technology LTD. He lives in Dorset with wife Mandy, daughters Leyla and Amberlee, Neo the black Labrador and various motorcycles.